John Vickers finally tracks down one of the three men who killed his true love. Before he dies, the miscreant admits that his accomplices joined the cavalry. 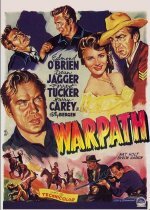 Vickers, a former officer himself, does likewise, after saving pretty Molly Quade from rowdy Sergeant O'Hara, who sets out to harass the new recruit. After incidents during a battle with the Sioux, Vickers is pretty sure O'Hara is one of his men. But can he reconcile his desire for vengeance with loyalty to the Army?